Modular visual interface for GDB in Python. This comes as a standalone single-file .gdbinit which, among the other things, enables a configurable dashboard showing the most relevant information during the program execution. Its main goal is to reduce the number of GDB commands issued to inspect the current program status allowing the programmer to focus on the control flow instead. 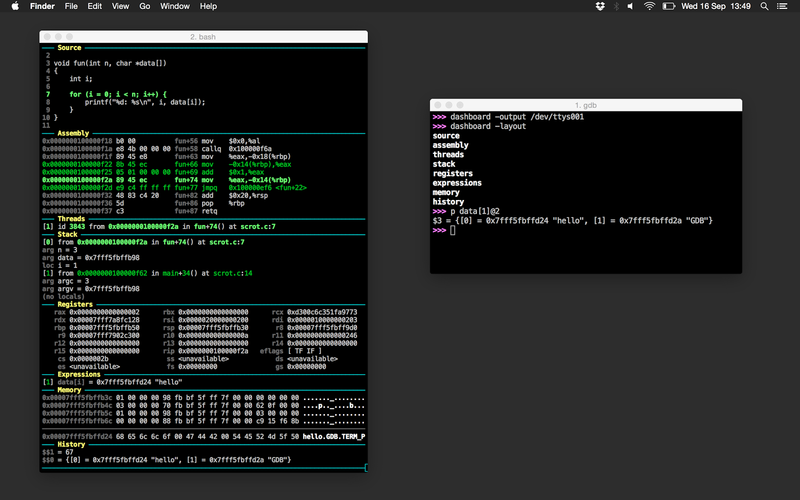 Write the dashboard to the main GDB console or to an external file/TTY. Interaction with GDB using the native Python API . Several default modules are included to address the most basic needs: source code, assembly, registers, etc.). User-defined modules can be easily developed by extending a Python class . Additional configuration files (both GDB and Python) are read from ~/.gdbinit.d/ . Fully stylable user interface and dynamic command prompt. No GDB command has been redefined, instead all the features are available as subcommands of the main dashboard command. GDB dashboard requires at least GDB 7.7 compiled with Python 2.7 in order to work properly. See #1 for more details/workarounds. Prevent the front from loading the .gdbinit file. For example, start TUI with gdbtui --nx . Follows the list of bundled default modules. Refer to the GDB help system for the full syntax. assembly shows the disassembled code surrounding the program counter. The instructions constituting the current statement are marked, if available. history lists the last entries of the GDB value history. memory allows to inspect memory regions. registers shows the CPU registers and their values. source shows the program source code, if available. stack shows the current stack trace including the function name and the file location, if available. Optionally list the frame arguments and locals too. threads lists the currently available threads. 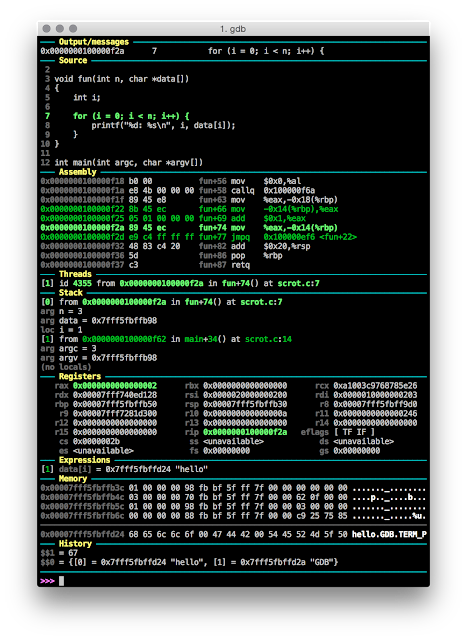 The GDB documentation is available at help dashboard . Just like any GDB command, abbreviations are possible. Moreover, the alias db resolves to dashboard . This is the root command and it is used to manually redisplay the dashboard. 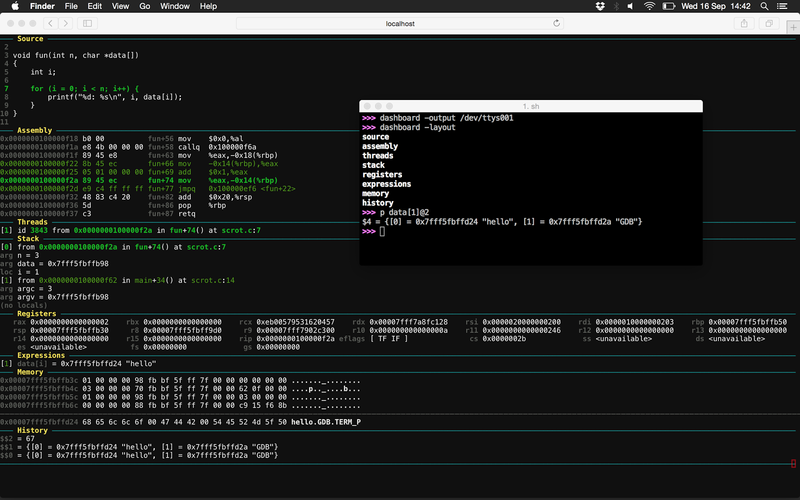 By default the dashboard is written to the GDB console but it is possible to redirect its output to a file or even to another terminal. If the target is a valid terminal TTY then its width is used to format the dashboard, otherwise fall back to the width of the main GDB console. Without argument reset this setting to the default. Pushing this even further, one could use a web browser as an auxiliary terminal using gotty . Enable or disable the automatic display of the dashboard whenever the target program stops. The dashboard is enabled by default and even when it is disabled, it can be manually displayed with dashboard . By default, all the modules are enabled and placed within the dashboard in alphabetical order. As the number of modules grows, it is important to decide which modules will be part of the dashboard, and where. Modules which do not appear in the list are disabled and placed after the last element in alphabetical order. When executed without arguments, this command lists all the available modules. The argument is parsed as a Python literal and converted to the proper type. When only the name is specified this command shows the current value, whereas without arguments prints all the attributes. Every module adds its own subcommand dashboard <module> which is used to toggle the enable flag and to redisplay the dashboard. Modules may also declare additional subcommands, see help dashboard <module> from GDB. Moreover, if a module declare some stylable attributes then the command dashboard <module> -style will be available. Its functioning is equivalent to the dashboard -style command but it does apply to a module. Files in ~/.gdbinit.d/ are executed in alphabetical order, but the preference is given to Python files. If there are subdirectories, they are walked recursively. The idea is to keep separated the custom modules definition from the configuration itself. The main configuration file can be placed in ~/.gdbinit.d/ (say ~/.gdbinit.d/init ) and should be used to tune the dashboard styles and modules configuration but also the usual GDB parameters. The alternative is to hard code changes in the provided .gdbinit , to do so just add new modules and GDB settings under # Default modules and # Better GDB defaults respectively. Colors and text styles are specified using ANSI escape codes. For example setting a style to 1;31 will produce ^[[1;31m , which will result in displaying the text red ( 31 ) and bright ( 1 ). The ANSI output can be disabled by setting the ansi attribute (note that this will not affect the command prompt). A divider is basically a terminal-wide horizontal line with an optional label. Primary dividers are those used to separate the modules, whereas secondary dividers may be used inside modules to logically separate different sections. When a section or module is empty then the styles used for the divider are those with the off qualifier. These are general purpose ANSI styles defined for convenience and used within the default modules. The idea of custom modules is that they provide ways to access readonly information from the target program status; it is safe to assume that they will be queried during the program execution only. label returns the module label which will appear in the divider. lines return a list of strings which will form the module content. When a module is temporarily unable to produce its content, it should return an empty list; its divider will then use the styles with the off qualifier. The name of a module is automatically obtained by the class name. Modules are instantiated once at initialization time and kept during the whole the GDB session. Optionally, a module may include a description which will appear in the GDB help system by specifying a Python docstring for the class. default is the initial value for this attribute. doc is the documentation of this attribute which will appear in the GDB help system. This key can be omitted. name is the name of the attribute of the Python object, defaults to the key value. type is the type of this attribute, it is used to coerce the value passed as an argument to the proper type, or raise an exception. This key defaults to the str type. check is a control callback which accept the coerced value and returns True if the value satisfies the constraint and False otherwise. This key is optional, when omitted no check is performed. action is the callback to be executed which accepts the raw input string from the GDB prompt. Callbacks may raise exceptions to notify erroneous situations which message will be shown automatically to the user. doc is the command documentation. completion is the completion policy, one of the gdb.COMPLETE_* constants defined in the reference manual . This key is optional and defaults to None which is equivalent to gdb.COMPLETE_NONE . A number of auxiliary common functions are defined in the global scope, they can be found in the provided .gdbinit and concern topics like ANSI output, divider formatting, conversion callbacks, etc. They should be more or less self-documented, some usage examples can be found within the bundled default modules. Default modules already provide a good example, but here is a simple module which may be used as a template for new custom modules, it allows the programmer to note down some snippets of text during the debugging session.